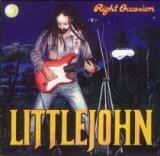 Right Occasion, the double CD from Northland's favourite rock-reggae artist Tony Littlejohn. The radiantly packaged compilation of 22 songs is out now with previous recordings and new ones re-mastered at Pride Recording Studios in Palmerston North. Tony and his band simply called Littlejohn perform 20 originals and two cover versions on this stunning set which is already recieving airplay around the country on indepedent and Maori radio stations. Tony's music ranges from the political radicalism to reggae chants, emotional ballads and spiritual wake-up calls. His musical genres cross from roots rock reggae to jazz funk and country tinged ballads.Always though there's the solid rhythms and infectious beats that'll get you on your feet and with a short time singing along. Favourites including Right Ocassion, Rock Dread, Enlightening, Let Your Body Move, I'n'I Talkin' , Newsflash, Legalise Life and True Friends have moved audiences all over the nation in the past 15-years. These along with more recent compositions including Heartwarrior, Night People, Ether (or), Change Yourself feature lyrics by poet Keith Newman) and the unforgettable Prisoner penned by Billy T K.
Featured musicians on the Right Ocassion compilation include Tony Littlejohn lead vocal, guitars; Gav Collinge, Mark Heke and Grant Calkin on second guitars; bass guitar Terrence Littlejohn and Neil Hannan; horns; Edwina Thorn and Paul Kentell; drums Lloyd Latimer, Vernon Roberts; percussion Thom Nepia, Vernon Roberts; background vocals Vernon Roberts, Mina Paikea, Jacqui FitzGerald, Gavin Collinge, Thom Nepia; additional drumn programs Lloyd Latimer; keyboards Roy Martin, additional keyboard programs Tony Neil. The album was engineered by Teheke McKinnon, Roy Martin and Neil Hannan and directed and produced by Tony Littlejohn. Tony Littlejohn's performances have moved crowds and soothed souls all over Aotearoa and parts of Australia for more than 30-years. Tony has been performing since the age of nine. He made his first album Littlejohn in 1972, which went into the Top 10 in New Zealand with the songs Dance All Around the World and Have You Heard A Man Cry. Tony, singer Corben Simpson and drum ace Bruno Lawrence, along with others, formed the legendary Blerta (Bruno Lawrence's Electric Revelation Travelling Apparatus). Tony and his brother Terrence have for years composed, arranged and performed their original songs. They have completed some 200 songs throughout their musical careers. Along with their original compositions Littlejohn love to play rearrangements of popular songs by artists such as Bob Marley and The Beatles. Littlejohn can be booked for public and private engagements.